When I found out from my friend Hannah that Molly Bears was offering mini bears for earlier losses, I knew I had to get one for Jordan. I sent an email to my friend Tamberly who makes Molly Bears asking about it and she said she would make my Jordan Bear. (She’s so sweet!) I just told her that the color yellow reminds me of him. It didn’t take long at all before this little precious arrived in the mail. Thank you so much Tamberly!! After opening presents on Christmas Day we made a trip out to the cemetery to visit Carleigh. I took out her new winter flowers to replace the old fall ones. The girls ran around and played for a little bit before the weather got the best of them. It was pretty chilly so I didn’t stay out very long either. Just long enough to put up the new flowers and take a few pictures. Remembering and missing my babies and my niece this holiday season and also remembering all the precious babies of the wonderful friends I have met. 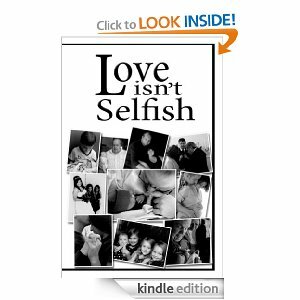 I wanted to share about my friend Keri's book called Love Isn't Selfish. You can find it on Amazon in paperback and Kindle. "Because scripture tells us clearly that God is Love (1 John 4:8), we know that God, by very nature, is relational. Love is an action, emotion, state, and characteristic that requires interaction with another being. Love does not exist alone. Scripture also tells us that we have been created in God’s image (Genesis 1:27). We were created to love Him in return, though loving Him will never be forced upon us because love isn't selfish. It is this line of thinking that leads me to the belief that the meaning of life is to learn how to love, and then teach others. Considering that our Great Commission (Matthew 28:19-20) is to go throughout the world and teach others about our Heavenly Father's commands (such as love God and love others; Matthew 22:37-39), we must learn first what Love is- who He is. Every relationship we form gives us the opportunity to learn a bit more about His character in order to have a better understanding of who He really is. Marriage, family, friends, neighbors, and even enemies can teach us much about who God is and who God isn’t. This book examines multiple relationships we experience and what valuable information we can gather from those relationships about the character of Love, which is to say, the character of God. It’s about learning to be unselfish in a selfish world." The book will be available for free on Kindle on December 25th! Today it has been 10 years since the day Jordan went to Heaven. I can’t believe it’s been a decade already. Seems just like yesterday I was 19 and facing a choice that seemed impossible yet was my only option. Of course, I know better now that I did have a choice. I wish that I had seen it then and that fear didn’t cloud my judgment. I still find it ironic to this day that within walking distance of my college house at the time was a women’s center that could have helped me, but I didn’t know that’s what it was. How different things would have called there instead of the clinic to get answers. I could play the what if game all day with the choices that I made but it wouldn’t change anything. I am thankful for the lessons I have learned through my experience and for the people I have helped because of it. It’s hard for me to wish things could have been different because if it had then I likely wouldn’t have my girls and I love them so much. Then I feel a little guilt for maybe not wishing things to be different. In a perfect world I would have them all and everything would be peachy. I do draw comfort that I will one day see Jordan in Heaven and embrace for the first time. I know my sweet baby has forgiven me and that my choices are not held against me. Sometimes it is hard to talk about, especially with other people. I never know how someone will react. I am so glad that so many of those who I have encountered have been supportive and have remembered Jordan with me. You are all so very special and I thank you! Today, Jordan, I will light a candle for you and think of the person you could have been. I will know in my heart that you are safe and waiting for the day I come home. Today is the day 4 years ago we learned of Carleigh’s fatal diagnosis. It honestly doesn’t sting like it used to. I am glad that it doesn’t but then that could also be because there was so much going on that day to even think much about it. We had 2 family Christmases and there’s always the busyness of tending to my little girlies here on earth. While it doesn’t have the same effect on me as it once did, I don’t think I will ever forget the day. I still remember the details and the emotions. I still remember feeling the hurt, the devastation, and the sadness. I still remember being lifted up by my God who is bigger than any diagnosis. I guess what I want to say is that I’m thankful and blessed to have been given my little girl, even though we walked and continue to walk a road we never wanted. I apologize for not posting last night so without further delay the winner of the Psyche Cremation Jewelry pendant is……. Congratulations Beth! I will get in touch with you! Thank you to everyone who entered and if you did not win Mark is very willing to make a custom pendant for you. You can contact him HERE. I have an absolutely wonderful giveaway that I am so happy to be able to provide thanks to the generosity of Mark Hamilton of Psyche Cremation Jewelry. Mark is a professional lampwork glass artist. 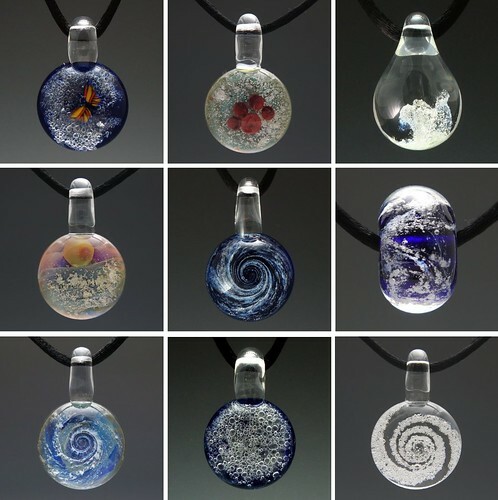 He has created many beautiful pieces of hand blown glass jewelry over the past 14+ years, but cremation jewelry is the most rewarding glass work he has done. Everything he creates is done by his hands and it is so different than anything I've ever seen before. Mark takes the ashes of your loved one and transforms it into the focal design of the pendant. Essentially, your loved one becomes part of the art! When you send Mark the ashes of your loved one, he treats them with great care and respect. He even requests a photo of your loved one and anything you want to tell him about them so that he may better create a custom pendant to capture who they are. I think this is something that is very important to know that the ashes of someone you love so much is being tenderly cared for. It also means a lot to know that someone is taking the time to get to really know the person who is missing from your life. Your pendant will be as unique as the person it was created for. "The Greek word for the soul is Psyche. In ancient Greece, the soul was personified as a butterfly and the word Psyche can be literally interpreted as “spirit, breath, life or animating force”. The Psyche is the element within a living being that gives them life and personality and continues “to breathe” even after leaving the body. To learn more about Mark's work you can visit Psyche Cremation Jewelry. Mark is providing a pendant (necklace not included) worth $77 for me to give away to one lucky person. (Thank you for your generosity, Mark!) A pendant worth more can be chosen by the winner but the winner must pay the difference. To enter, please visit Mark's website and tell me which pendant is your favorite in a comment below. The giveaway will remain open until Monday 12 pm EST and a winner will be announced that evening. Sorry if your baby is not on the list. Please leave a comment if you would like your baby added.